This year, the theme is, choose your own Qwazy… Have you made a project that just turned out plain crazy? Perhaps your currently making your crazy project. It can be a quilt, a wallhanging, even a pair of potholders. Perhaps it’s a project that you created that didn’t turn out quite right… Let’s have some fun and see what you’ve done. While I have done the patchwork crazy block before here, I wanted to expand on my initial project for this hop. Loved the shiny fabric look, perfect for a wall hanging. I made a few more blocks for this hop but I just wasn't feeling it. My project didn't "spark joy," a prerequisite to proceeding forward. Around the turn of the New Year, I bought a box of fabric and quilting magazines from an online auction site. The publication date of the magazines ranged from 1977 to 1982. It appears during that time frame, Crazy Quilts were all the rage. I bumped into more than one article on Crazy Quilts and here are some snippets. Now THAT is a look I could live with! The Doodle Quilt is crazy block squares bordered and sashed in cream. Yaaas! I have that cream-colored precut in abundance. I pulled all the bright pretty colored fabric from my remnants to be cut into 2-1/2" squares that played well together. I had some yellow flying geese that came through mystery quilter and added that to the mix. Sharp-eyed quilters will see that yes, only two diagonal lines are quilted in that lead-off image. I have a balky Brother machine that seems to be good for only piecing. It may be time to upgrade. Time to visit those other QQQs strutting their stuff on this hop. I continue to participate in the Instagram #IGQuiltfest as tamaschen. 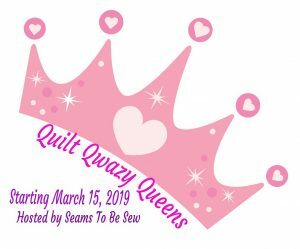 One of the advantages of being on that platform is one of the longarmers in the fest offered a special of $100 to quilt a king-sized quilt (includes postage back). I jumped on that offer. 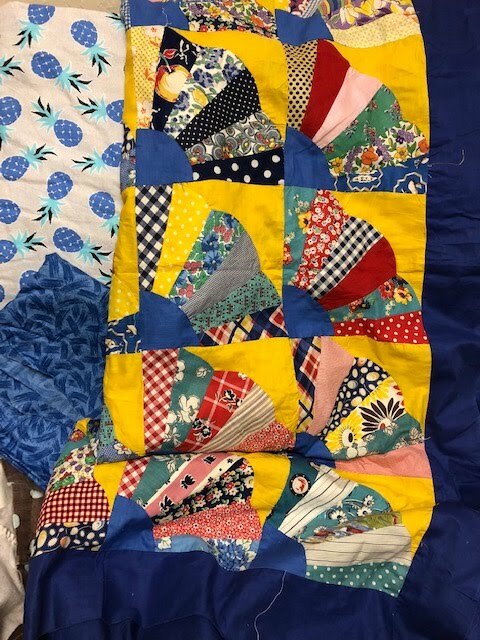 I have been looking for a longarmer to complete my vintage fan quilt. I do not want to quilt this on my domestic machine. I am so excited to finally get this quilted. The flimsy came from my mom's cedar chest discovered during her move to assisted living. We place it at 75 years or older. On a whim, I decided to visit Drytown where a flea market was being held. At my first stop, I asked if she had any fabric, what did you know? 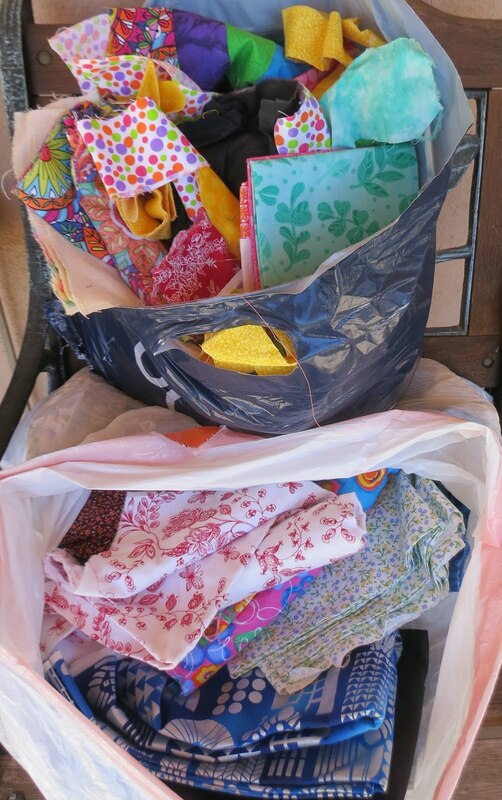 she was a quilter who wanted to destash. She brought out two large tubs and a remnants in a small tub. Even when I picked through what she had, it didn't look like I made a dent. Here are my bags o' goodness purchased for a total of $20. The fabric is all current, at least within the last 10 years. Some of it was so bright, it made me grit my teeth. That stuff was sent to the Great Thrift Shop Beyond. Included in the lot was a large piece of wide-backed denim print yardage, *woohoo* I supplemented it with a pineapple print I have been saving for the fan quilt backing. The longarmer will have enough buffer loading it onto her machine. Another $2.50 bag of fabric landed from thrift, with the martini glass print being the one that attracted me the most. This lot is older with one of the panels dated 1994. Because I have been obtaining newer zoomier fabric, I bagged up all of my small remnants and have thrifted them back. I have really tried to do a leaders and enders project but I never get around the cutting it up and forget to lead off and end with those 2-1/2" squares. Best I stick to larger pieces of fabric. This "doodle" quilt will be my car quilt. You know, the one quilt you have in the car just in case you need to transport one of your fur babies. Appropriately enough, the backing is dogs, yardage from one of my recent thrift shop finds. Do you have a car/van/SUV quilt? Your quilt is very pretty, and I love the dog fabric. I've never used a quilt in a car for my fur babies, but it's a great idea! Great quilts! I don't have a car quilt, but we don't have pets. Thanks so much for sharing! how fun. my mom used to have one of those pillows. i keep a regular blanket in my car. hmmm maybe i should change this. thank you for sharing today. I find crazy quilts fascinating. Thanks! I have a big bag of car quilts, and I'm not sure why. Maybe because I have run out of room in the house. LOL!! I'm ready to picnic some day! Yes, I do have a car quilt/blanket. I keep one in there at all times. In the winter it's good for emergency's, in the summer I can use it at the beach and year round it great for the grandkids. Thanks for sharing! i don't have a car quilt guess i need to make one. Funny that I never made myself a car quilt, but all my kids and adult grandkids have made by me ones! Added to my list of should dos! I love your Qwazy project. 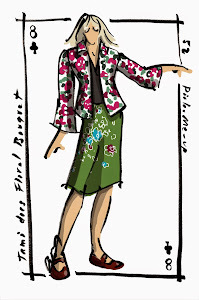 The Doodle quilt is a beauty and hearing about your shopping treasures is so much fun! Wow! I would love to find a scrap pile like that! No car quilt, but occasionally we do carry a cover of some kind when we travel. Love your quilt. When our LQS was going out of business, I bought several mini-charms packs. I think I am going to do something similar to what you did. I am going to use it as a leader-ender while I am working on other projects. You have some wonderful scraps!! I have had them in the past, but then the kids would take the car, and the "blanket" would disappear, get used for mechanics, or it would take up the smell of the spare tire in the trunk, even if it were in a plastic container. Finally gave up on the idea. Maybe I'm old... but I definitely remember the crazy quilt craze of the late 70s-80s. I may have 1 or 2 patterns/ideas snipped from magazines of the time. Definitely had a crazy quilted wallhanging that I never "finished". I just hung it up, and would add more embroidery to it about twice a year. I appreciate you realizing that only a certain amount of "crazy" fits in with your current aesthetic. Good luck finishing the quilting on the Doodle Quilt. Wow...what a haul in those bags! I loved seeing the old magazines about Crazy Quilting. Everything old is new again! Great quilt! I don't have a car quilt, but I do have a 70 pound lap dog!! She only rides in our laps when riding!! Thanks for sharing your project. I am tempted to try some crazy quilting, on a small project however. I do like your quilt. Can totally relate to a project needing to "speak to me & keep me working at it". Thanks for sharing! We don't keep a quilt in the car, but we do have quilts that go with us when we travel. If we are going on a long ride, I usually bring along something to stitch. You scored big with your haul. I don't know if I could have just stopped with what you stopped at. I don't have a car quilt but I would like to make one that stays in the car all the time. I am thinking along the lines of quillow. A blanket yes, but not a car quilt! No I don't have one of those quilts. I keep a blanket in my quilt bag for carrying to appointments but that's it. What a qwazy deal you got on that fabric!!! My poor dog has to do with a heavy wool blanket that I keep on my back seat to protect it from her nails. Maybe I need to make a quilt for it!! That is a deal to have your king size quilt quilted for $100! Thanks for showing us your thrift shop treasures - you just never know! And yes, everyone needs a car quilt. Thanks for sharing this qwazy fun.